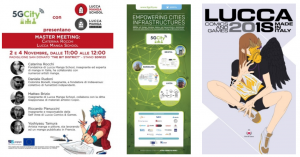 Lucca Nov 2018 – The City of Lucca was protagonist on #5G topic in the occasion of Lucca Comics and Games 2018 edition, from October 31st to November 4th. During Lucca Comics and Games took place the first #5G deployment of equipment and demo testing of specific use cases for the 5GCity project. The great innovation theme of #5G, the fifth-generation wireless standard, had its own dedicated space, dissemination, activities, Master Class meetings, and demos in preview, to confirm the primacy of Lucca in the 5G development. All this thanks to the 5GCity project, funded by the European Commission. The consortium of the project is formed by 18 partners from 7 European countries. Among the Italian partners: the presence of the public administration of Lucca and important national companies in the field of new technologies, telecommunications, media, and events, such as: RAI, Wind Tre, Nextworks, Italtel, and Comunicare Digitale. At the SDN123 booth in the ‘BIT DISTRICT’-San Donato Pavilion, it was possible to watch, in absolute preview, the upcoming opportunities offered by the 5G, with live demonstrations, immersive 360º videos, innovative proposals on the “neutral host”, as living proof of a closer than ever future. To combine theory with practice and open a direct dialogue with “Millennials”, two meetings were organized with the Lucca Manga School, to create a bridge between the primacy of the Lucca School, the digital manga creative industry, the content production, in presence of this latest infrastructure, the #5G wireless technologies. A unique opportunity to learn about #5G in the beautiful Tuscan city that celebrates one of its most important events of the year, the Lucca Comics and Games; this year not only with an outstanding number of millennials but also with important results in the 5GCity experimentation of infrastructure and demos. The Municipality of Lucca participates in the 5GCity project by offering the city’s network infrastructure to test the possibilities that the new #5G technology can offer to the Public Administrations in the development of digital services for the city. Moreover, it will have the possibility to demonstrate how to deal with infrastructural issues in the deployment of 5th generation networks by optimizing the number of antennas and devices installed – and the architectural, infrastructural and environmental impact, without affecting the services offered. – an audio-video product in 4K-HDR that will be used both for technical distribution tests on the #5G network and as a promotional / dissemination video of the 5GCity project. This video product broadly explains the technical concepts underlying the research project, enhancing the potential #5G networks in the future. The video features Mario Cipollini, the great champion of road cycling. – A 360 ° video audio product, best example of “immersive” experience used at Casa Puccini Museum, in which an unexpected guest will take the user to discover Giacomo Puccini’s birthplace. During the Lucca Comics and Games 2018 was previewed the two productions that embrace both the technological and creative-editorial aspects. The augmented reality experience was specifically made with city of Lucca contents with the use of HoloLens, enriching the real vision with holographic models superimposed on the normal user’s view. These technologies and contents were visible at the 5GCity stand, transiting on the new network infrastructure of Lucca Municipality specifically deployed within the project, thanks to the technological contribution of important partners such as: Nextworks, Italtel, and Wind Tre. Rai is the leader of the “UHD Video Distribution & Immersive Services” use case within the 5GCity project. The 5GCity project has the precise aim of evaluating #5G technology service through specific use cases in the cities of Barcelona, Bristol and Lucca, with the aim of demonstrating how a neutral host operator; in our case Lucca, can offer the creation of multi-operator mobile connectivity solutions to meet the high demand for coverage in areas with a high concentration of users; as it happens in the city in conjunction with the Lucca Comics and Games.